response to over 10 drugs. Do you relate to more than one of our Pharma Profiles? Benefit from a reduced price on additional purchases. Visit the cart for more information. Identify potentially ineffective drugs to better guide ADHD treatment decisions. Many people diagnosed with attention deficit hyperactivity disorder (ADHD) decide to use drugs to mitigate the symptoms and improve everyday lives. Using a simple genetic (or DNA) test, you can avoid potentially ineffective treatments and unwanted side effects. The chosen drug could be inappropriate for your genetic profile, making treatment ineffective and causing unwanted side effects. A quick and simple saliva test is all that’s needed to avoid a potentially long trial-and-error process. If you have been diagnosed with ADHD, a BiogeniQ Profile can help guide your treatment by identifying the drugs that could be incompatible with your DNA. The ADHD Pharma Profile tells you which drugs are potentially incompatible. We recommend that you discuss this report with your healthcare professional so it can be added to your medical record. You and your doctor will then be able to make more informed decisions regarding your treatment by adapting the choice of medication and dosage to your genetic profile. 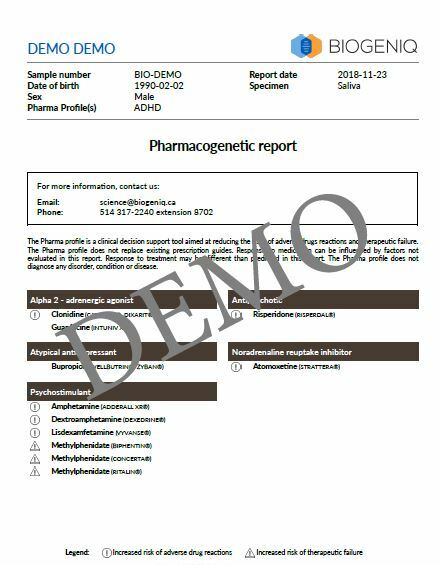 Are you curious to see what an ADHD Pharma Profile report looks like? The full report is 5 pages long. To view an excerpt of a sample report, click on the button below. Note that a copy of the report can be send to your healthcare professional. To help guide your treatment. Reduce trial-and-error prescribing to find the right treatment faster. To avoid inappropriate or potentially dangerous drugs. Pinpoint which drugs could be ineffective or cause unwanted side effects.